Back in January 2014, the signing of the alliance of religions agreement led by Chairman Lee and conducted between the Catholic and Muslim leaders has brought a cease-fire of a 40-year conflict in Mindanao. Governor Esmael Toto Mangudadatu sent a special invitation to Chairman Lee to celebrate the day of the signing of peace treaty as well as the 2nd Annual Commemoration of the Declaration of World Peace. Officially proclaiming January 24th as HWPL day of Maguindanao as a day of peace, the commemorative event particularly included the unveiling of the Mindanao Peace Agreement Monument. 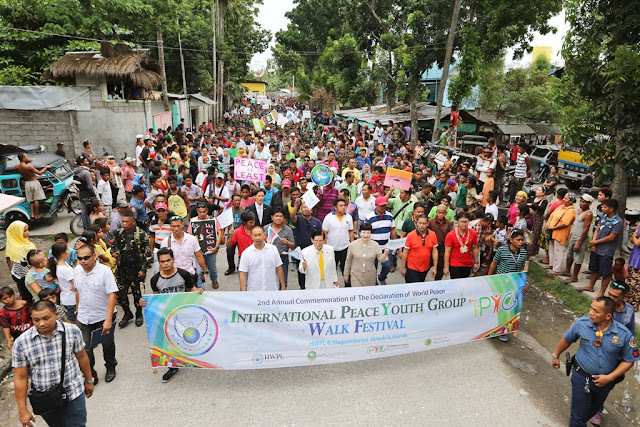 The International Peace Youth Walk Festival was followed after the ceremony and over 3,000 youths in Maguidanao marched together. Generose Coyme, a youth participant of the rally shared how she was deeply moved, “Mindanao bears too much pains and sorrows. 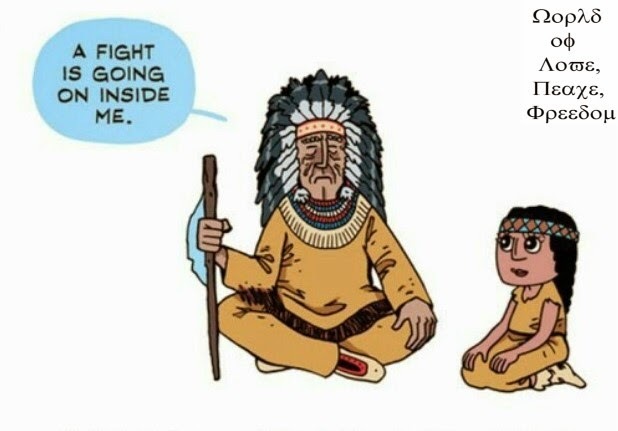 It is one of the most conflicted regions in the world. From seeing HWPL’s active involvement in Mindanao with their peace initiatives every year, I can feel that this purely civil organization looks after the whole world and loves the neighboring countries as their own.”The memorial demonstrated the unity and commitment of the people of Mindanao embracing people from different backgrounds and defining the right framework for the community to achieve sustainable peace. 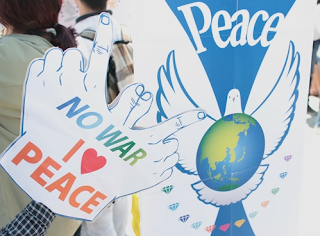 NO WAR, I LOVE PEACE! In the meantime, the mayor and members of the city council of the city of Alexandria, Virginia has acknowledged HWPL’s dedication in bringing people of different religions together for the establishment of peace and has recently proclaimed September 18th as the ‘World Alliance of Religions Day’ to commemorate the World Alliance of Religions’ Peace (WARP) Summit, an unprecedented international peace festival held by HWPL on September 18th in Seoul, Republic of Korea. In addition to the accomplishments above, the National Assembly of Ecuador has recently conferred an award of national recognition to acknowledge and cooperate with the works of HWPL for the commemoration of May 25th. In the preamble to the award, the government of Ecuador recognizes that HWPL has dedicated, since its foundation, the efforts and energy aimed at actively pursuing missions widely supported by many countries while solving current issues of the world for the purpose of restoring human dignity. While the government also recognizes the works of IWPG and IPYG, the award of national recognition highlighted hard work of Chairman Lee of HWPL in spreading the global peace movement. The National Assembly of Ecuador has expressed its sincere gratitude for Mr. Lee’s spirit of volunteerism and his dedication toward preserving and fostering culture of peace. 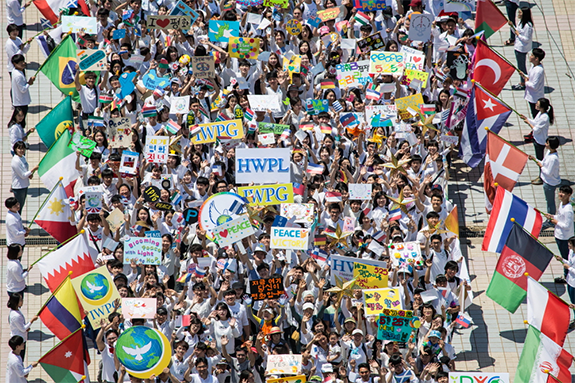 HWPL Peace Day, on May 25th 2015, Youths, Women, and Individuals from all walks of life simultaneously participated in the ‘2nd Annual Commemoration of the Declaration of World Peace’ and ‘International Peace Youth Group Walk Festival, initiated in Olympic park Seoul, South Korea.